A common problem in complex interfaces’ design is stopping at data display without going deeper towards information. To achieve a great user experience, we have to pull through data. Those of you who follow me will know about my obsession with data vs. information (and deeper structures like knowledge and wisdom). This is a touchy subject, but suffice it to say that I understand data as just the representation of a value, while information is data presented in a context as to affect behaviour. Problem arises when interfaces dealing with complex systems, where a lot of data is involved, stop at just data display, leaving transforming this data into information up to the user. People use systems to help them complete tasks, particularly data-crunching (where computers excel) ones. It can be very difficult to create an intelligent system that really interprets data, but heuristic strategies can be deduced from observation and then algorithmically applied to the system. It is quite easy to spot a data-centric interface: it usually comprises some kind of long table with lots of different values (numeric is the norm here). If you are lucky maybe there are some ordering actions available, and even some filtering. From then onwards you will have to fight with the data to get the information you need. After all, like Ronald Coase said, “If you torture the data long enough, it will confess”. 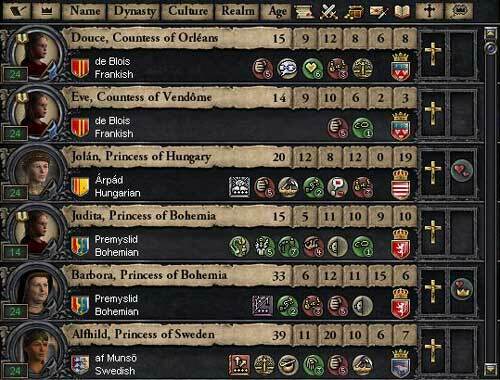 Marrying is a critical task in Crusader Kings 2, a medieval rpg-strategy videogame; although we have a lot of values and icons on potential brides on display (seems medieval Meetic was highly advanced)… How can we understand what makes up for a “good catch” from this interface? Why am I presenting this data to my user? What do I expect a veteran user to do with this data in order to complete his task? What behavior would this information trigger? After going through these questions you will have some ideas on how to pre-process data and start turning it into information. If you are not able to answer these, you should start by observing your users. Ethnography rules, but online forums can also be an invaluable source of information: inexperienced users turn to forums for advice, and veteran users teach their (usually heuristic) strategies. You can get a lot of insights there. I plan to expand on this topic in future articles showing some concrete examples: Crusader Kings 2 and Football Manager might be good candidates, as you can see from the figures illustrating this article. Stay tuned! This entry was posted in Videogaming by javiergala. Bookmark the permalink. Javier Gala is an well-rounded Senior UX Designer with Interaction Design, Information Architecture, Research, Ideation & Usability experience and a growing interest in psychology, front-end coding, project management & business. Getting ready for UX Spain!